The game of Video Poker is highly popular among City Club Casino players especially those who like the concept of a one man’s poker playing against the computer rather than playing in a multi player round the table old fashion poker. City Club Video Poker is based on getting a set of cards which is listed in the pay table. Each game features different sets of winning hands and various payout rates. A City Club Video Poker player places a bet and is dealt with a five cards hand. If the hand is a winning hand than the player wins and gets paid in accordance to the bet placed and the pay table rates. In case the hand is not a winning hand the player can then swap up to three cards in order to try and get a winning combination. The machine deals new cards instead of those discarded and if the hand is winning hand the player gets paid. The winning combination are the same as in traditional poker when the higher the hand the better the payout. Jacks or Better for instance pays starting a pair of jacks and higher. Deuces Wild pays three of a kind and higher when all deuces are wild cards meaning the can count as any card. 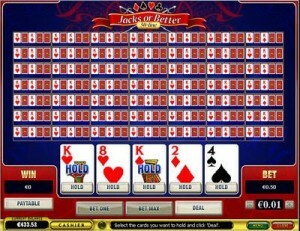 Aces and Faces is like Jacks or better but with a higher payout for 4 of a kind with aces or faces. There are 15 different game version for City Club Video Poker. If you wish to enjoy City Club Video Poker or any of City Club Casino Games, go to City Club Download page and download our casino software. Install it onto your PC, register your account at City Club Online Casino and you’re all set and good to go playing City Club Casino Games. If you’re concerned about your privacy and don’t want to have the software installed onto your PC, you can still play City Club Casino using the online flash version of our casino which lets you play online anywhere you may be using nothing but a web browser. If there is anything else you want to know about our casino, if you have issues opening an account, require technical support or customer service, or simply wish to inquire about our policies and services, please contact us and we will do our best to assist you on any matter.